The Inside Scoop Online: President Barack Obama IS Really an American Citizen, WOW!!! President Barack Obama IS Really an American Citizen, WOW!!! Alvin T. Onaka, Ph.D., State Registrar, has certified, on April 25, 2011, that the Certificate of Live Birth, State of Hawaii, Department of Health File Number 151-61-10641 (displayed below) is a true copy or abstract of the record on file in his office. President Barack Hussein Obama, II was born on August 4, 1961, at 7:24 p.m. at the Kapiolani Maternity and Gynecologicial Hospital inside the city limits of Honolulu, Oahu Island, Hawaii. His parents resided inside the city limits at 6085 Kalanianaole Highway, Honolulu, Hawaii. President Barack Obama's father was Barack Hussein Obama. He was 25 years old at the time of President Obama's birth. Mr. Obama, Sr., was a student at a University at the time of the birth. Also, Mr. Obama, who was born in Kenya, East Africa. In the section detailing race of the father, Mr. Obama Sr. is listed as African. President Obama's mother was Stanley Ann Dunham Obama who had no occupation at the time of the birth. She was 18 years old and from Wichita, Kansas. In the section dealing race of the mother, Mrs. Obama is listed as Caucasian. This is not likely to end the "birthers" pursuit of this issue. 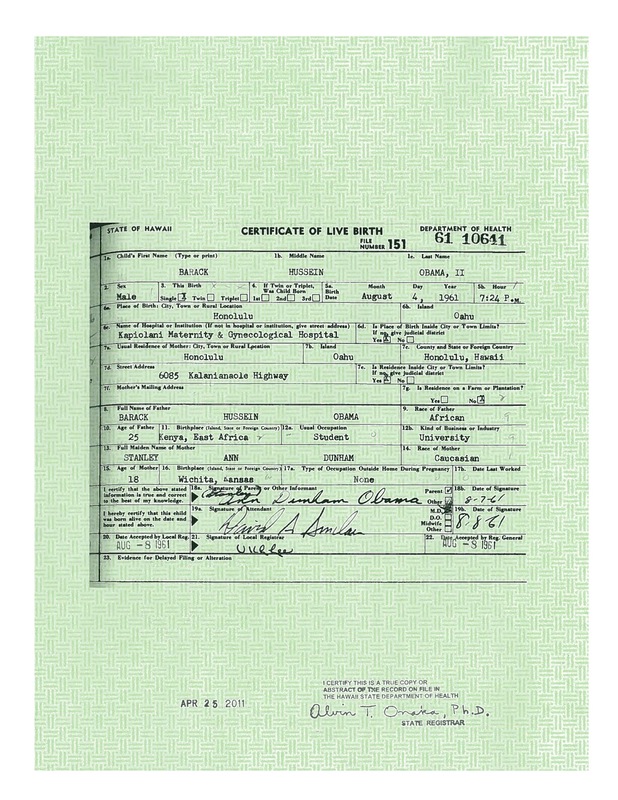 However, the Whitehouse has gone the extra mile in releasing this "long form" birth certificate.